Well, hello! Baby Hill is now 16 weeks! Can’t believe it has already been 4 months! How crazy! 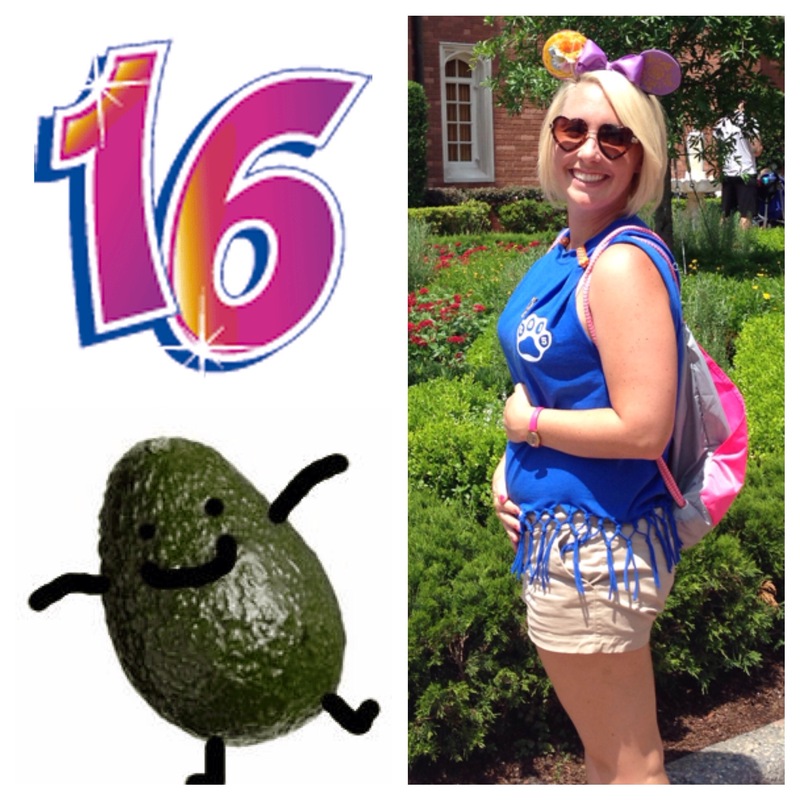 Peanut is far from peanut sized… With this weeks fruit comparison being an avocado (4.5-5 inches). Gender Update: I still have 4 more long weeks to wait until we know if Baby Hill is a gal or a gent. I will continue to anxiously await that news! Cravings: The only thing I have even remotely craved in my daily diet is milk. Which is strange because I am not usually that much of a milk drinker. However, if baby wants milk… Mummy drinks it. Other than that baby just likes food, which is okay with me…since I like food too! Food Aversions: Apart from lettuce, soda, and any form of vitamin, no foods really make me queasy. However, I did have my first ‘queasy from smell’ moment last week. Ranch flavored chips (or crisps for you Brits). Now that smell made me queasy enough to kick a kid into the hallway to finish their snack. Bleh! 1. As you can see in my photo, I have not gained any baby weight. Only gained about 3lbs total… And that was fully clothed. My husband can feel a bit more of a baby bump though, which is exciting for us both. Makes it feel a bit more real! 2. I also went to Epcot on a field trip (hence the ears in the photo). Technically, Peanut traveled the world for the first time and had lots of yummy food and, as shown in the photo, had its first trip to “England”! Perhaps baby will like daddy’s voice enough it’ll try to have a cute, English accent too! 3. I will update again in 2 weeks! 16 weeks down, 24 more to go!